On page 98 of the original division history is a picture of a bunch of mighty fighting soldiers in battle uniforms standing below a chaplain in Geronsweiler, Germany on New Year's Day - 1945. In the history they are not identified. These men, all members of the 405th Regiment, Co. F., are in a rather quiet manner, befitting a church service and listening to the kind words of the Division Chaplain. They are rather obviously in battle uniform and "under arms." They have been out of the front lines long enough to attend services, and this opportunity was welcomed by many, as the picture shows. 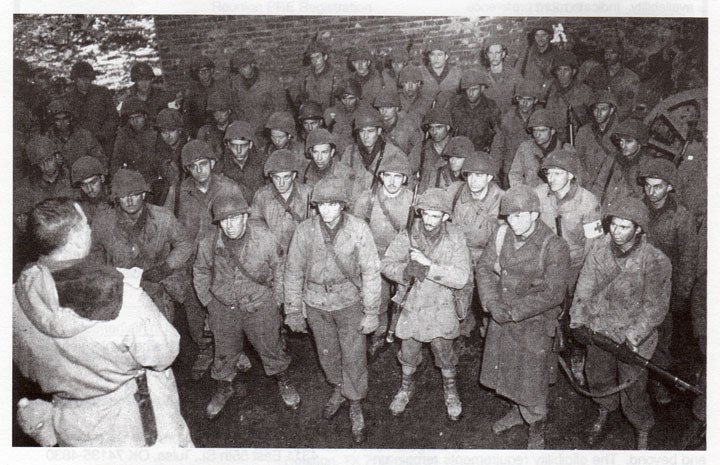 These are the soldiers who will go out and hold the line during the "Battle of the Bulge". And soon fight into Ruhrdorf and across the flooded Roer River, to take Tetz and Boslar. These are the men who will, God willing, cross the Rhine and go on to victory in Germany and meet the Russians at the Elbe. As of January 2002, Ed Souder knows of only two who are still living. Here it is interesting to note that the chaplain has not been in any foxholes and is in a spotless uniform and with neatly trimmed hair. Contrast this with the men he is talking to -- in battle gear and freshly out of the mud and grime of the fox holes. The above story, "Unknown - In The History Book", by Ed Souder, 405th, Co. F., was originally published in the 102d Division "Ozark Notes", Vol. 54, No. 4, July/Sept., 2002, pp. 18. Original Story submitted on 30 March 2005. Story added to website on 30 March 2005.